Customize achievement awards for your employees with our Custom Obelisk Small Marble Award customizable with a single logo imprint. Stunningly depicting the ancient Greek structure Obelisk, this award in small size, symbolizes power, strength, and achievement. Its magnificent construction rises to a splendid 3" in height and weighs 2.10 pounds. The artistic base is distinguished from the majestic monolith by solid brass spheres. 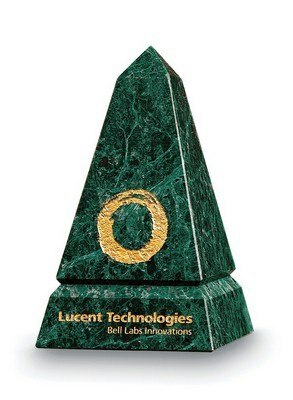 The company information and award related messages are etched in gold laden carvings on both the monolith and the base. This work of art makes an impressive recognition piece that commemorates exceptional services, major business milestones, and outstanding team efforts.